What if the whole world knows who you are, but you wake up to find you have forgotten everything since high school? When Caleb wakes up in a glamorous LA clinic, he is a changed man. His once-scrawny body is toned, his now-white teeth gleam, and everyone looks at him in adoration. Caleb shouldn’t even be in the US–he’s English, and has never traveled farther than London. Somehow Caleb transformed from an eighteen-year old, sexually questioning, reclusive high school student who spent his free time composing and practicing music in his parents’ shabby council flat to become a world famous rock star with adoring fans and his own mansion overlooking the Pacific. Caleb bravely tries to fit into his new life as he recovers from his amnesia. But who is the handsome assistant publicity manager who visits him in the hospital? Why does everyone think Caleb is straight? What has Caleb forgotten? And will he ever remember? 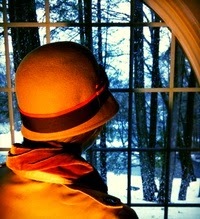 Alexandra Ainsworth loves cloche hats, Earl Grey tea, and romance books. She wrote her first historical romance at age eight and gave it to her grandmother for her birthday. It had illustrations and involved a lot of fainting and a main character named Loretta. She's glad that her readers now are not subjected to her artwork. She sometimes wonders if the naked men in her books might be an inadvertent consequence of attending a women's college for four years.